We work as a one-stop shop organization to meet all your needs. Every client gets the full benefit of our substantial experience in equipment installation, maintenance and monitoring. We have applied our knowhow to perfect a process that has been proven in hundreds of installations. From our insightful project management through commissioning and faultless installations, we have built a strong reputation and a successful track record. We are an authorized distributor and installer for all major cinema industry manufacturers and suppliers – Barco, Sony Digital Cinema & NEC projection systems; Dolby and Barco servers; and QSC, JBL & MAG loudspeakers – implementing the latest image and sound technologies. Thanks to our invaluable relationships with equipment suppliers, CinemaNext always leverages it to best serve our clients commercially and technically. It enables us to provide the best and most appropriate packages to meet our clients’ needs. More than 100 Dolby Atmos™ installations have been overseen by our engineers and technicians. 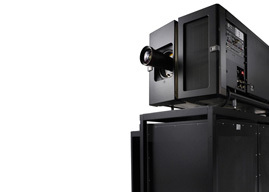 CinemaNext was the first service provider to offer the Dolby Cinema concept as well as Barco 4K Laser projection system and Sony Dual Stack 4K projection system. We are a “glocal” partner. We develop a global vision with local/regional implementation through our offices located in 20 countries across Europe. We also maintain in-house a powerful supply chain and logistics department with a team fully dedicated to fulfilling client orders in terms of pricing strategy, procurement, delivery and follow up with all major cinema industry manufacturers and suppliers.